Here is the official schedule for the Delta Queen for the next couple of days which might be her last active days as overnight passenger steamboat on the rivers. 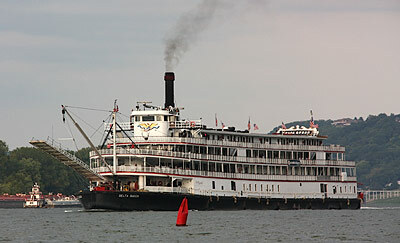 (click to enlarge) The picture shows the Delta Queen on the Ohio River at Anderson Ferry near Cincinnati, OH. The Delta Queen will arrive in Memphis on Thursday, October 30, for her final visit of the 2008 season. She is scheduled to come in at 8 a.m., but most likely she will be there in the early morning hours. 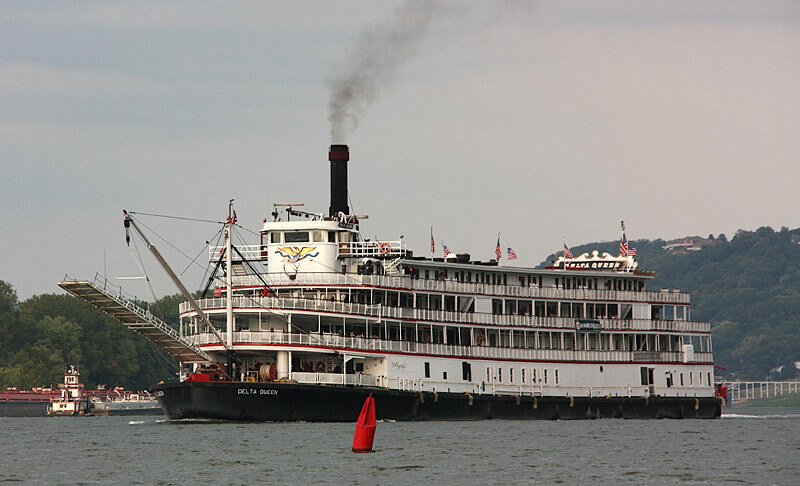 Majestic America Line will hold a "Farewell Tribute" ceremony from 5:00 to 6:00 p.m. On Friday, October 31, at 6:00 p.m. the boat will depart Memphis for New Orleans with no passengers and only a skeleton crew onboard. At each of five more ports along the way, the Tribute ceremony will be repeated. The grassroots Save the Delta Queen Campaign and the Mississippi Delta Grassroots Caucus urge everyone to come down to the waterfront to enjoy the boat’s legendary calliope and performances by the Delta Queen band and singers, but most importantly to rally in favor of keeping this quintessential American treasure in full operation. Thursday, October 30 – Memphis, 5:00-6:00 p.m.
Saturday, November 1 – Helena, Arkansas, 4:00-5:00 p.m.
Sunday, November 2 – Greenville, Mississippi, 4:00-5:00 p.m.
Monday, November 3 – Vicksburg, Mississippi, 4:00-5:00 p.m.
Tuesday, November 4 – Natchez, Mississippi, 4:00-5:00 p.m.
Wednesday, November 5 – Baton Rouge, Louisiana, 4:00-5:00 p.m.
On Thursday, November 6, the Delta Queen will dock at Oak Alley Plantation for a private onboard ceremony. Plans are still in progress for events in New Orleans when the boat arrives there on Friday, November 7. Wake Up Congress! The time to act is now! thank you so much for hanging with the Queen! We hung your post onto today’s Ladder and would like to be available for anything you need to promote during the week, as The Queen approaches New Orleans. Perhaps we can get something going there. If you do a daily post on her passage down the river, please email that to me so I can post it on the Ladder too. She is just as gorgeous at Port in New Orleans, like a jeweled hand in an embroidered glove. He has a great steamboat story. Thank you again, and do contact us if we can help publicize the voyages of The Queen.